Like Donna Collins (reporter in Namibia) recent remarks and enclosed pic, all the print media in Namibia have carried similar stories, the Windhoek Observer, The Namibian, New Era, The Economist and the Informante. All seek answers as to why the Namibian seals were in July considered officially healthy, thriving and over-populated and in need of culling, that allowed Namibia to issue the highest cull (genocidal) quota of 85 000 nursing baby seals in birthing breeding grounds. A practice banned throughout the world since 1983. When just three months later, sealers are burying 900 pups a day and pup growth normally at 30 grams/day had been recorded in 2006, as 2 grams/day. Slowly reports started coming in of seals stranding and dying of starvation. Soon even the Namibian Ministry acknowledged that pups born will not survive weaning age (October/November). Sealers themselves admitted that sealing has ended one month earlier, "as there are just not any more pups" to (club and kill). Here is what two reporters in Namibia are saying, Donna Collins, "The seal cull together with the untimely mass death of starving seals, must be ranked as one of the country's largest wildlife tragedies. 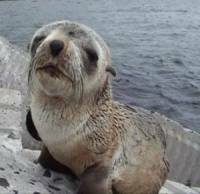 And the sight of Namibia's Cape Fur seals starving to death each day is beyond words. I have witnessed the despair and helplessness of these creatures, who crawl ashore or onto rocks where they collapse and die - too weak, too emaciated and too ill to continue the fight for survival. Every day I go to a place where granite boulders form a small harbour at Swakopmund's popular Mole beach, only to see the dead bodies from the day before. 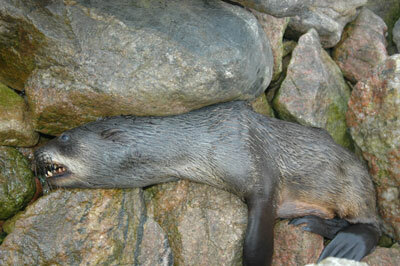 Some have fallen between the cracks, other's are still lying on the rocks - dead, or scattered onto the beach below. Some are huddled together where they died in comfort of each others bodies, but many are alone. They are all painfully thin, desperately sick and clearly victims of the most inhumane suffering that has been bestowed upon them. In my opinion the Namibian authorities, scientists and fisheries boffins have treated the seals worse than vermin - stripped them of their dignity and right to life. But still, the suffering continues, and the world stands by and watches while this marine mammal is not so slowly being reduced to rotting corpses along our coastline." The respected Namibian Economist Editor's theory, www.economist.com.na/27%20Oct/27%20Oct.htm. Consider the facts: Although this mass starvation of seals is now in the media, it is not the first such event. We know it occurred in 1988, a big one in 1994, 1995 and 1996. 2000 was bigger, and 2001 and now again in 2006. 7-times in the last 18 years, Namibia has hidden the reason why it allows one third to one half of its indigenous protected seals found nowhere else on earth to pitifully starve to death from hunger - each time, during and after sealing season has ended. So why are so many seals suddenly dying now? 75% of the Namibian seal population occurs on two unnatural mainland seal colonies. From July to November, everyday, for the next 150 days, groups of sealers will charge into 300 000 wild seals in their attempts to smash the heads of 600 nursing baby seals each day. The result the entire colony of seals flee, causing widespread massive disturbance. Nursing pups still suckling on mother's milk and who pose no threat to fisheries, are separated from their mothers, and flee, north and south. Within three months the seal colonies have become completely deserted, seals have fled this crime against nature, this genocide. Whilst the seals slowly starve to death from separation. Scientist sickenly claim, "well they are going to die anyway, why not club the weak to death." If this were true - why then do sealers bury 900 pups a day and still club their quota?